Caption: White dwarfs in the globular cluster M4. In this picture, only the faintest stars are white dwarfs. A hot andaging star exhibits something never seen before. Sounds like a lurid Hollywood tale, but the discovery is a cosmic one. Astronomershave found a white dwarf star with a surface temperature of 359,500 degreesFahrenheit (200,000 Celsius). It's so hot that "its photosphere exhibits emission lines in the ultravioletspectrum, a phenomenon that has never been seen before," the researcherssaid in a statement today. Ultravioletlight, part of the same electromagneticspectrum that includes radio waves, visible light and X-rays, is invisibleto the human eye. 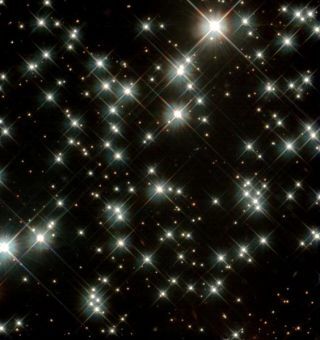 Starsof intermediate mass, around one to eight times the heft of the sun, terminatetheir life as an Earth-sizedwhite dwarfs after the exhaustion of their nuclear fuel. During thetransition from a nuclear-burning star to the white dwarf stage, a star becomesvery hot. Thewhite dwarf, named KPD 0005+5106, is among the hotteststars ever known. Catching one so hot is a low-probability affair, becausethey don?t stay that hot for long. Oursun is about 10,000 degrees Fahrenheit. Scientists have previously theorizedthat surfaces of the hottest stars could be up to 215,000 degrees F (120,000degrees Celsius). For short times, when stars much more massive than the sunexplode, the inside temperature could reach as high as 10 billion degrees F.
Thefinding, from observations by NASA's space-based Far-Ultraviolet SpectroscopicExplorer (FUSE), will be detailed in the journal Astronomy &Astrophysics.